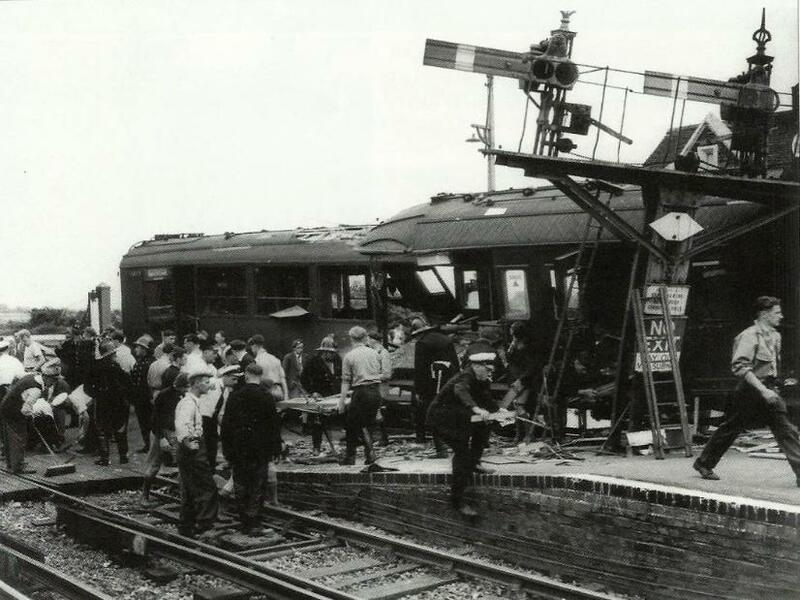 On Sunday, 5th August, 1951, at 11.58 a.m., at Ford Station on the Brighton-Portsmouth line in the Southern Region, British Railways, collision between two electric passenger trains which occurred. The 11.17 a m . Brighton to Portsmouth train, which was hooked to stop at the Down main platform, ran past the home signal at danger and collided at about l8 m.p.h. with the rear of the 10.47a.m. Three Bridges to Bognor train which was standing at the loop platform. I regret to state that eight passengers and the motorman of the incoming train were killed and 47 passengers were injured, of whom 40 were detained in hospital. First aid was given at once by railway-men and members of the public who were in the vicinity, and the response to an emergency appeal was prompt and adequate. Police, Fire Brigade, doctors, nurses and ambulances began to arrive within 10 minutes and a continuous flow of assistance was maintained, so that no time was Lost in attending to the injured and sending them to hospital. Staff from the nearby Royal Naval Air Service aerodrome were particularly helpful. Both trains were made up of multiple unit stock marshalled in two-car units. The coaches had steel underframes, and the bodies were of composite construction with steel panels on wood framing and with wood roofs. Each pair of vehicles was closecoupled and the units were connected with screw couplings. The Portsmouth train consisted of six coaches with a driving trailer composite coach leading, and the Bognor train was made up of eight coaches with a motor 3rd-brake at the front and a driving trailer at the rear. The overall length of the Portsmouth train was 388 feet, and its weight was 222 tons; the overall length of the Bognor train was 518 feet and it weighed 298 tons. The Westinghouse air brake operated on all wheels and the brake power of each train was 59 % of the tare weight. The first vehicle of the Portsmouth train and the rear vehicle of the Bognor train were telescoped together for about 40 feet and four other coaches were damaged to a varying degree. There was no derail- ment nor damage to the track, but the signal post at the Brighton end of the Down platform was twisted and had to be replaced. Current on the Down lines was cut off by the opening of the high speed breakers on short circuit, and current on the other lines was switched off within two minutes of the accident on request from the Ford signalman. 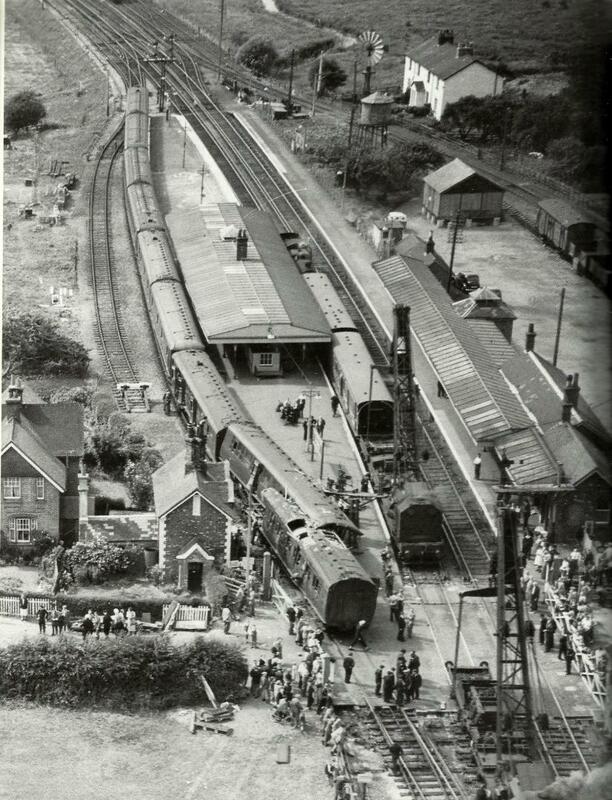 Prompt steps were taken to reorganise the traffic; trains east of Ford were terminated and started from Littlehampton, and Barnham was used as a terminal on the west side. An emergency 'bus service was run between Littlehampton and Bognor, and between Littlehampton and Ford. Breakdown cranes from Fratton and Brighton arrived early in the afternoon and the Up line was cleared by 5.45 p.m.; normal working was finally resumed at 7.50 p.m., after an interruption of nearly seven hours. The weather was fine and the rails were dry. The Brighton-Portsmouth double line runs in a westerly direction and Ford Station lies to the west of the Arundel-Littlehampton triangle and the Arun river bridge, as indicated on the drawing. The Three Bridges line runs roughly north and south and joins the Brighton line at the north-east corner of the triangle. Littlehampton is two miles to the south-east of Ford. The northern leg of the Aruudel triangle is the main line and the west leg connecting Littlehampton to Ford is the branch line. There is an island platform on the Down side of Ford Station and each face is 474 feet long. These platforms can accommodate six-coach trains but are just too short for eight-coach trains. The road from Arundel to Ford crosses the railway on the level at the east end of the station. 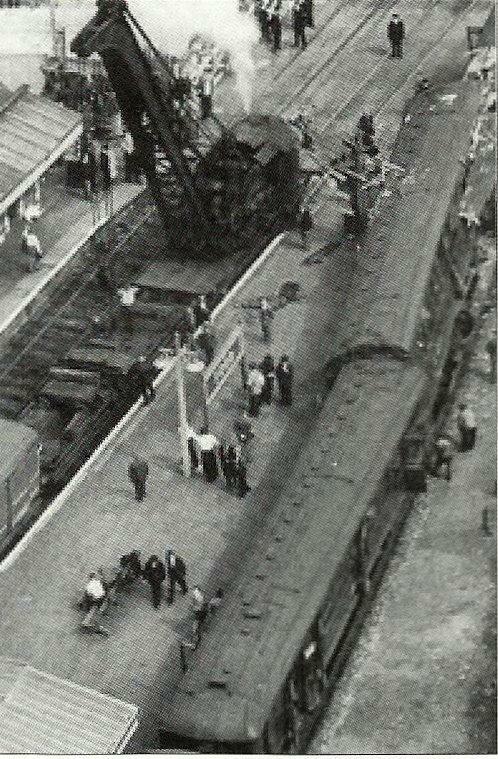 The Bognor train was standing in the loop with the rear coach projecting 30 feet beyond the end of the platform. (f) No. 22 Loop to Down Siding shunt signal requires No. 18 catch points reversrd, which in turn lock No. 46 signal lever in the normal position. The Down platforms are used regularly for the reversal of trains from the Three Bridges and Littlehampton lines, and hence Nos. 4 and 5 Up Starting signals have been provided at the east end of this platform. Track circuit H "holds the road" between No. 5 Loop Up Starter and the Up facing points of No. 32 crossover and it cannot be replaced by a mechanical locking bar on account of the level crossing. Owing to the short length of the platform an eight-coach train must stop in the Loop line with its buffers opposite No. 45 Down Starter (about 10 yards ahead of the end of the platform) in order to clear the track circuit at its rear. The Down Main and Loop platforms are used for the reversal of some trains, namely eight daily from Mondays to Fridays, twelve on Saturdays and four on Sundays. The two telescoped coaches were built in 1937 and, as already stated, they had steel under frames and bodies of composite construction with steel panels on wood framing. Considerable development has been made in design since then. The electric rolling stock now being built for the Southern Region has an all-welded steel body on a riveted steel under frame, and the latest British Railways’ design incorporates an all-welded steel body on an all-welded steel under frame. The shear strength of the body end is taken at a point just above floor level and is based on the ultimate shear strength of the materials involved. The future stock will also be fitted with automatic couplers which should minimise risk of over-riding of coupled under frames; the fitting of these couplers would not have affected this accident, in which there was no telescoping of coupled coaches. The Three Bridges to Bognor train was routed via Littlehampton and the west leg of the Arundel Junction triangle. It was booked to arrive at 11.50 a.m. at Ford Station Loop platform, where it was due to wait for five minutes so as to allow the Portsmouth train to precede it to Barnham after stopping at the Down Main Platform a t 11.52 a m .
On the morning of the accident the Bognor train was two minutes late leaving Littlehampton, but Signalman R. W. Arnell in Ford box gave it preference over the Portsmouth train, in accordance with the booked working, when both were offered to him at 11.51 a m . by Arundel Junction on the branch and main line block instruments respectively. He accordingly set the route into the loop platform by reversing No. 32 crossover and pulling Nos. 34 and 19 F.P.L. levers. He then closed the level crossing to road traffic and cleared No. 49 Outer Home followed a little later by No. 46 Inner Home. Arnell knew that the Bognor train was too long for the loop platform so he restored No. 46 signal behind it, reversed No. 18 catch points and then pulled No. 22 shunt signal lever to enable the motorman to draw forward so as to clear track circuit H. The train arrived at 11.54a m and Arnell then accepted the Portsmouth train on the main line instrument. He received the "Entering Section" signal for it a minute later but could not restore No. 32 crossover because the track circuit was still occupied. He therefore did not lower No. 47 Outer Home until he saw the front of the train stop at the signal, which was just visible from his box. He shouted to the guard of the Bognor train to hurry up and draw ahead but by then the Portsmouth train was approaching the Inner Home, apparently under control. Arnell thought it was stopping there, and it was not until he heard the rattle of the leading bogies passing through No. 32 facing points that he realised it had run past the signal. He rushed to the window in an attempt to attract the motorman's attention but the front cab was by this time opposite the box and the motorman did not appear to hear his shout nor to see his hand signal. In the next moment the collision occurred, with the results already described. ArneU promptly sent "Obstruction Danger" to the boxes on either side and requested the Havant control to cut off the traction current. He thought that the train passed the signal box at about the normal speed of a stopping train and he was positive there had been no emergency application of the brake. If it had been applied he would have heard the escape of air and the noise of the brake blocks on the wheels. Arnell was quite sure that the arms of the two Inner Home signals were at danger and his state- ment was confirmed by Mr. A. H. Hunt, an independent witness, who said he was standing outside his chalet near the railway and saw the signal arms in the horizontal position both before and after the train passed. The accident was also witnessed by Lieutenant L. E. Hall, Royal Navy, who was driving his car towards Arundel and had stopped at the south side of the level crossing when the gates were closed to road traffic. Shortly afterwards he saw a train stop at the loop platform with the rear coach projecting over the level crossing and the buffers directly in front of his car. About a minute or so later Lieut. Hall saw another train approach from the Arundel direction at a speed which he thought was about 30 m.p.h., though it might have been less. He quite expected it to pass through on the Main line but as it neared the station it appeared to swerve to the left. He saw a look of astonishment on the face of the driver, who leant over towards the right and appeared to be pulling at a control lever with his left hand. The driver was on the left side of the cab and there was nobody else with him. Lieut. Hall had a lucky escape when the crash occurred immediately in front of his car, which was covered with glass and splinters. H. J. West, the motorman of the Bognor train, said that on arriving at Ford he stopped at the end of the loop platform, applied the brake lightly, and then crossed to the right hand side to see what the guard wanted him to do. He noticed that the shunt signal had been cleared so that he could draw ahead and get the rear bogie off the track circuit. He was still waiting for the guard's signal when the collision occurred a minute or two later and drove the train forward about three feet. Porter D. Harrigan, who was on duty on the Down platform, and Guard S. E. C. Eames of the Bognor train both said they knew that the train had to draw forward, but there was a misunderstanding as to who should give the order. Harrigan expected the guard to give the signal after all passengers had alighted but Eames said that on previous occasions the porter had waved to the motorman. There was also some delay in trying to find the owner of a scarf which had been left in one of the carriages, and no action was taken by either man to get the train clear of the track circuit. Guard W. S. Knight of the Portsmouth train, who was travelling in the brake compartment at the front of the fifth coach, said that the journey was uneventful’as far as Arundel Junction, where they were held up for 2+ minutes. The signal cleared eventually and the train moved on to Ford Outer Home, where it was again stopped for half a minute. Knight, who was looking through the periscope, saw this signal clear but then he began booking the delays in the train register and did not notice the aspect of the lnner Home when they ran past it. He thought that the speed at the moment of collision was about normal for a train which was due to stop at the main line platform. Knight described how he tested the brakes before leaving Brighton and found them satisfactory, with 75 lbs. pressure showing on the gauge in his van. He said that no difficulty had been experienced in stopping at any of the stations en route or at the Arundel Junction Home and Ford Outer Home signals. Before leaving Brighton he had a short conversation with the late Motorman Sherwood, who seemed to be in good health and good spirits. After the accident the electrical controls and interlocking of Ford signal box were thoroughly tested and found to be correct ; the arms of Nos. 44 and 46 signals were working freely. The brakes of the Portsmouth train were also in good order. The motorman's cab had been demolished as the result of the collision but Inspector Staniford found the controller in the debris ; the key was in the reverse instead of in the forward position. The Inspector was confident that the key must have been turned by the motorman at the last moment ; it had to be depressed 6rst before it could be moved and he did not think this could have been done by any of the rescue squad. He explained that in a case of absolute emergency a motorman would reverse the controller and that he would probably do this before applying the brakes. Tests carried out after the accident indicated that a train stopping at the Down main platform would pass the Inner Home signal at about 25 m.p.h. and would be travelling at about 18 m.p.h. when the leading cab passed over the level crossing. 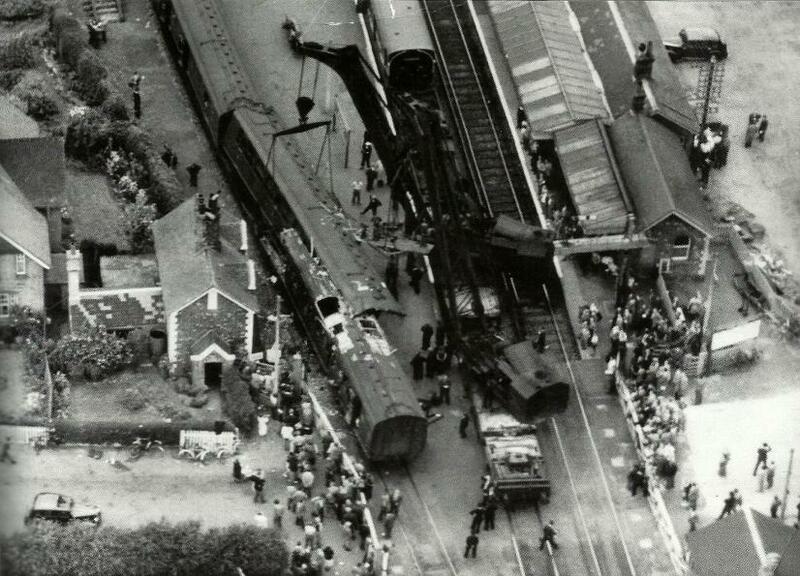 An emergency application of the brake would have stopped a six-coach train in about 70 yards from a speed of 25 m.p.h. This accident was due to the Portsmouth train over-running the Inner Home signal but owing to the regrettable death of Motorman Sherwood the circumstances in which this occurred must remain to some extent a matter for conjecture. There is no doubt, however, that both the Inner Home signals were at danger when the train passed them. The mechanical interlocking and the electrical controls were correct, hence, No. 46 signal must have been returned to danger after passage of the Bognor train in order to release No. 22 shunt signal ; thereafter it was locked by occupation of track circuits E and H. No. 44 must also have been normal because it was held in this position by crossover No. 32 reversed which in turn was locked by track circuit H. Both these signal arms were found to be working freely and could not have stuck in the off position; they were also seen at danger by two witnesses. Finally No. 47 Outer Home could not have been cleared unless both Nos. 44 and 46 signal levers were normal in the frame, and the Portsmouth train could not have been accepted unless No. 47 was also normal. Thus all the Down Main signals must have been at danger when the Portsmouth train was accepted, after which No. 47 alone could have been cleared. Both trains were correctly accepted and signalled by Signalman Arnell and the Portsmouth train was also properly stopped at this signal in accordance with Rule 39A before it was allowed to proceed to the Inner Home. Both the Inner Home signals can be seen clearly from the cab of a train approaching from Arundel Junction. They stand out against the skyline and are excellently sited. As soon as the train reaches the Arun river bridge both main lines through the station come into view directly ahead, and I think that Sherwood, on seeing the Down main platform line clear jumped to the conclusion that the Inner Home was "off" and entered the station at the normal speed for a stopping train. Apparently it was not until he was running through the crossover that he realised his mistake and it was then too late to avert a collision Sherwood appeared to be in good health when Guard Knight spoke to him in Brighton and Lieutenant Hall's evidence shows that he was at his post up to the last moment ; a postmortem examination confirmed that he died from his injuries and not from any other cause. He was 53 years old, and had been a motorman for the last six years of his 37 years railway service; he had a very good record. This accident might have been averted, or at least the speed of collision would have been reduced if Guard Knight had made an emergency brake application on passing the Inner Home signal at danger. He was, however, making entries in the train journal and did not see this signal, which would have been clearly visible through the periscope in his van. Rule 148 requires a guard to watch carefully the running of the train and to take any action that may be necessary when approaching important junctions and stations at which it is hooked to stop. He is also required to keep a good look-out, and should he see any reason to apprehend danger, be must make every effort to attract the attention of the driver, and in cases of emergency he must apply the brake in order to stop the train. It is appreciated that guards have other duties and cannot he continuously on the look-out, but on this occasion Knight, who had been keeping a good look-out up to this point, should not have allowed his attention to he diverted by other work while the train was approaching the Inner Home signal especially after it had been stopped at the Outer Home in accordance with Rule 39A. It is unfortunate that there was a misunderstanding between Porter Harrigan and Guard Eames about moving the Bognor train. If either of them had acted promptly, track circuit H could have been cleared and No. 32 crossover could then have been restored before the arrival of the Portsmouth train. This accident is another example of failure of the human element, and it illustrates once again the reliance which must, of necessity, be placed on motormen and other responsible members of the railway staff to carry out scrupulously the fundamental rules of railway safety; observance of signals is one which requires no emphasis. The restoration of main line points behind a train is also a practice which should be invariably carried out as soon as possible after the train has passed. The conditions at Ford have been investigated to see how the present difficulties can be overcome, and the lengthening of the down platform to take an eight coach train seems to be the best solution. I understand that this work will be completed before next summer, when the longer stopping trains will again he in service. The damage to the two telescoped vehicles was not abnormal for a speed of collision of 18 m.p.h., particularly as the point of impact was probably on the right-hand buffer of the stationary vehicle and not on the centre line. The Latest Southern Region coaches would have offered greater resistance and the subsequent damage might have been less severe; future stock will be even stronger. The coaches of the type involved in this accident have, however, many more years of useful life and premature scrapping cannot be justified.